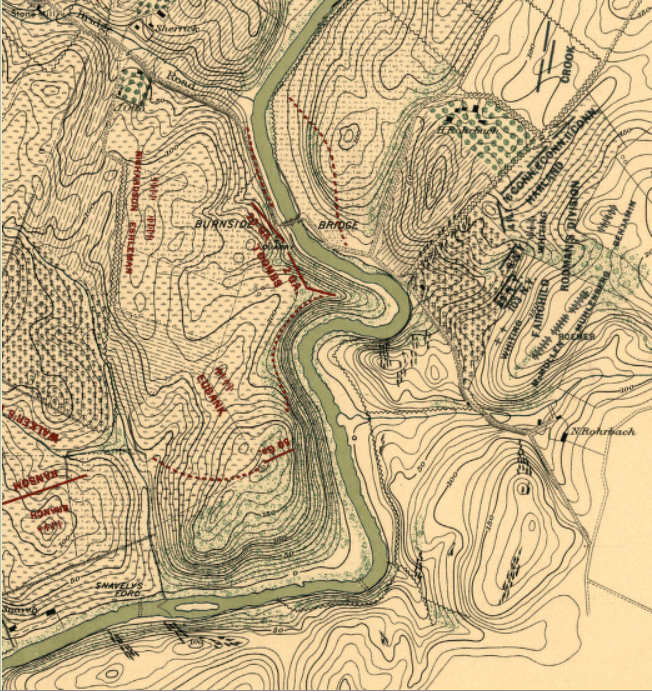 I have always been committed to determining the routes, camps and battle positions of the 8th Connecticut Volunteer Infantry and Oliver Case. I strive to be as accurate as possible in the hopes of not only being true in the telling of Oliver’s story but also in the hopes that I can physically walk in his footsteps. The location at the top of my list has always been the fields and woods around Sharpsburg where Oliver gave “his last full measure of devotion” on September 17, 1862. I’ve had the good fortune of living a short distance from the battlefield for a number of years and getting to know people interested in and knowledgeable about the battle. Somewhere in the neighborhood of fifty hikes, solo and with a few other brave souls, have allowed me a much closer study of the terrain. Also, it has been my privilege to develop and lead a number of military staff rides at Antietam over the past few years that brought me onto the field and into Oliver’s footsteps. No person has been more helpful in the process of understanding what Oliver Case and his fellow Connecticut soldiers faced at Antietam than John Banks, the author of two outstanding books on Connecticut soldiers and CW blogger of the highest order. A man I am now privileged to call a friend. About two weeks ago, I was able to join John and Bob Anderson (ancestor of Corporal Robert Ferriss, a member of the 8th CVI color guard killed at the battle) to retrace, to the extent possible, the steps of Corporal Ferriss and Private Case of the 16th and 17th of September 1862. It was a wonderful day as detailed by John Banks. This outing caused me to revisit the route of the 8th Connecticut during these two days. I have studied in great detail and am very familiar with the actions and route of the 8th after 1:00pm on September 17,1862 as all this property from Snavely’s Ford to the 8th Connecticut’s monument is part of the Antietam National Battlefield and accessible (or at least viewable) from the trail system in the park. I believe I have a solid handle on the last four to five hours of Oliver’s young life and John Banks and I have covered this ground on many occasions. However, since the property is not accessible by the general public, I’ve always made assumptions about the actions of the 8th Connecticut on the day before the battle and the morning of the battle as they marched in from the Geeting Farm near Keedysville onto the Rohrbach farm near the famous bridge that now bears the name of Ambrose Burnside, their commanding general that day. Since our visit to part of the Rohrbach farm two weeks ago made possible by its current owner, Ann Corcoran, I’ve become determined to pinpoint the locations of the 8th with much a greater specificity. In conducting the research and taking into account what I learned during Ann’s tour of the farm, I may have raised more questions for myself than I answered. Over the next few posts, I will attempt to lay out my best guess as to the locations of the 8th using Ezra Carmen’s maps as a starting point then modifying them to best represent the information from reports and letters of the men who walked the ground over those two days. Some may dispute my conclusions and additional information may help improve my accuracy which I welcome. This entry was posted in Antietam and tagged Case, Connecticut Volunteer Infantry Regiment, Ezra Carman, Geeting Farm, John Banks, Robert Ferriss, Rohrbach farm, Snavely's Ford. Bookmark the permalink.